At Indigenous Ingenuities, our name is a direct representation of who we are. Through creative solutions we aim to meet the needs of our client while utilizing as many local resources as possible. We provide our customers with sound ecological and economical guidance towards meeting their specific needs. Whether it be for public / commercial design or for private / residential installations, Indigenous Ingenuities is a multifaceted design and build landscape company. We focus on serving our local community, both socially and environmentally. Whether it's a classical design or a patio for entertaining, Helen & her team will design something that will give you a reason to linger a bit longer in your own piece of paradise. 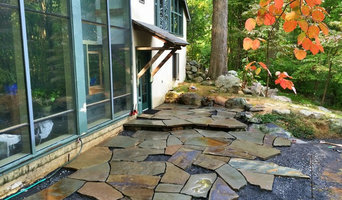 GroundTec, Inc. is a full-service award winning landscape design/build company. We provide a range of services including design and consultation, landscape, hardscape, and masonry installation. Landscape Design Services. Allow us to create your design that you will be proud of for years. We pride ourselves in providing professional horticultural services, superior nursery material, and environmentally-sound landscape practices. Service to our clients is paramount to our success. Best of Houzz 2018 and 2019. Earth Work Design provides a full-service design and development experience. From concept and design through permitting and construction. For over 20 years we have been designing and building the finest landscapes and outdoor environments throughout New Jersey and Pennsylvania. Dear Garden Associates is a professionally recognized landscape design, build and garden maintenance company best described by our core values: reliability, accessibility and sustainability. B. DeMichele Inc. has been owned and operated by Blase DeMichele since 1994, providing superior workmanship and excellent customer service in PA, NJ and DE. B. DeMichele Inc. is a full-service residential and commercial company specializing in innovative designs and installations of hardscaping, landscaping, nightscaping, irrigation, water gardens and all phases of concrete work. Our business is built on quality workmanship; all our employees are properly trained, mastering cutting-edge trends and techniques, making us a leader in the industry. We are a single location firm with a strong work ethic, taking pride in all our everyday operations enabling us to deliver unmatchable results and creating exactly what you envisioned according to your needs and style. Our successful company is comprised of the following divisions: - Hardscaping - Landscaping and Irrigation - Concrete - Maintenance These four divisions mutually support each other. Such diversification gives us the ability to work as a team, completing both simple and complex projects effectively while maintaining the finest professional service. B. DeMichele Inc. impeccable and functional design and installation will add not only beauty but value to your home. When we have completed an installation, there are no worries; you are ready to utilize your new space immediately. No stone was left unturned. Founded in 1979, GLDesigns has designed and installed projects from Hatboro to The Hamptons. We want to work with you to bring out the best your property has to offer – for you, your family & friends! Best of Houzz 2019 Winner! For 25 years, ACD has been the industry leader in stamped concrete and colored concrete patios, walkways, driveways, pool decks and outdoor living. When homeowners are thinking of ways to beautify their outdoors, whether a driveway, patio or pool deck, concrete is often an underestimated option. Our company has been changing people’s minds about concrete for more than 25 years. Architectural Concrete Design (ACD) specializes in decorative stamped concrete, as well as stained concrete, exposed aggregate and other hardscape services. The customer service aspect of ACD’s business is another element that sets us apart from others. After making contact, a designer will visit a homeowner’s property to find out what they have in mind, and create a design to review. Once a budget is established, design approved and contract finalized, the project is turned over to operations, where a dedicated operations manager will be helping see things through. 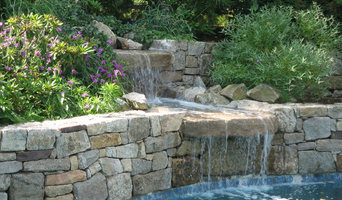 Here at FS Landscaping Contractors, we are swimming pool design-build and outdoor living specialists. We are committed to providing the highest quality service at affordable prices. Greenview Designs is a design build landscaping company, serving central New Jersey and Bucks County PA in the landscape and hardscape business since 1987. Let us put our extensive design knowledge of hardscapes and landscapes to work for you. We pride ourselves on timely communication, customer service and taking the time to review and provide samples of plant materials, hardscape materials and lighting fixtures to name a few. Custom Swimming Pools & Pool Houses $150,000 to 3 Million: Pool Renovations $175,000 to $750,000. 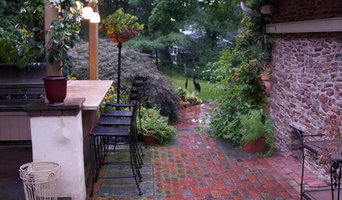 Outdoor Cooking Stations, Bars & Kitchens; $10,000 to $275,000. 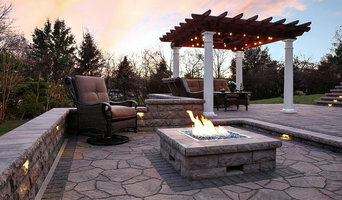 Outdoor Fireplaces -Custom Fire Pits $2,500 to $150,000. Low Voltage Lighting Packages; $5,000.00 to $250,000. Pergola’s, Timber Frame Structures, Sheds $10,000 to 2 million. These are estimates based on experience and past projects. Your actual costs may vary depending budget and materials. Contact us for a consultation today. We will work closely with you throughout your project from initial design to completion. We are fully insured and have state of the art equipment to complete your project in a proper and timely manner for you and your family to enjoy for many years ahead. Contact us to setup an appointment to visit our state of the art design studio where you can meet our owner Dave Busch, Anthony Calvitti, owner of Blue Haven Pools and our certified landscape architect. You will have peace of mind knowing your working with a team that has 100 years of combined industry experience! We strive to engage our clients in outdoor living. Creating a sense of place with livable spaces and landscapes that include diverse plant combinations that border function and ecology. GINKGO GROUP Firm has been established from the year 1992 to present, designing & building Award Winning Pools & Landscapes. Our firm will Design - Build - Maintain, your entire project all under one roof. With our degreed in house staff of designers and project managers, there is no project to small or to large with our firm's success and reputation to successfully Design/Build your custom dream outdoor living space. GINKGO GROUP firm strives on excellence not just only with our projects, but with excellence in customer service and communication with all of our client's needs throughout the entire stage course process. Over 37 years, Rich's Landscaping has become one of the finest hardscaping design and construction companies in Bucks County. We take pride in providing our clients with quality, durable results. Liquidscapes is committed to designing and building fine quality pools and landscapes for the tri-state area. We have dedicated 40 years to our craft, disciplines, process and methodologies. With every client we take the time to evaluate the site conditions, regulations and all the associated needs and requirements of the client and their space before design development occurs. We pride ourselves on a TEAM approach with the best professionals in the industry to create a sound design for our clients. Through this collaborative approach and effort, it has always produces our greatest results and most rewarding experiences. Burke Brothers is an award-winning landscape design/build firm that specializes in the design and installation of extraordinary landscapes. With dedication, imagination, and careful planning we design, build, and manage the landscape style that you want…the landscape style that complements your home and your life. Beechwood Landscape Architecture and Construction, LLC is comprised of a group of professionals that are committed to setting a high standard of quality and commitment in the Landscape Design/Build industry. Our team is comprised of individuals with varied experience in the Landscape Construction industry. Beechwood staffs Landscape Architects, Nurserymen, Horticulturist and Landscape Construction Specialists which provides us with a team approach. From our initial consultation, to the design development stage, through construction implementation, Beechwood will manage each project design to insure satisfaction at every stage. We are committed to deliver uncompromised quality and integrity in all aspects of construction. Customer service and satisfaction are our primary resources for continued growth and expansion! 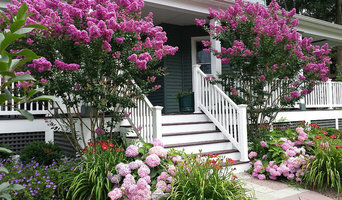 Doerler Landscapes is a family business that was founded in 1962. Doerler provides custom, award winning, professional landscape design and installation services, and is considered a premier Design/Build Landscape Architectural firm. By constructing projects that we design, Doerler Landscapes can create not only innovative plans and solutions, but also superior value. Doerler Landscapes has vast experience with a full range of plant material, as well as construction products, their costs and limitations. Clients benefit from this experience during the entire design, budget and construction process. We regularly have clients throughout Central New Jersey as well as Eastern Pennsylvania. Our projects can be found in Lawrenceville, Princeton, Skillman, Hopewell, Hillsborough, Pennington, West Windsor, Princeton Junction, Robbinsville, Hamilton, Lumberton and Moorestown just to name some of towns that we serve.